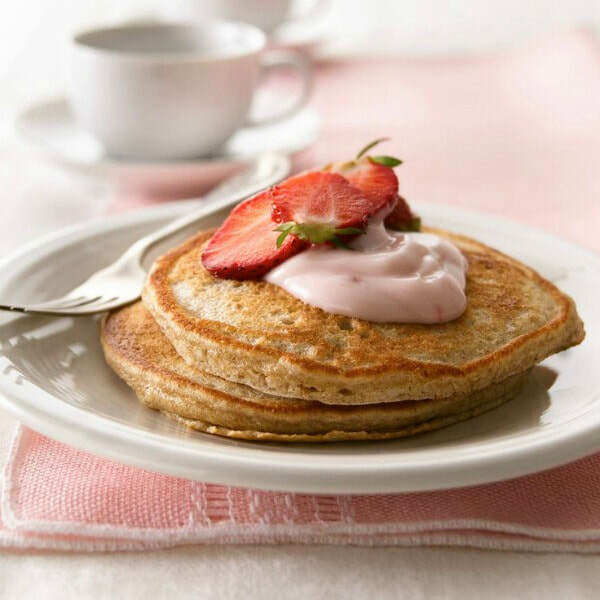 Whole wheat flour, yogurt, and strawberries take average pancakes and make them tastier and healthier. The added fiber and protein make this a great breakfast option for the family! Try other types of berries and different flavors of yogurt to mix things up. In a large bowl, mix together flour, sugar, baking powder, baking soda, and salt; set aside. In a separate bowl, beat eggs, plain yogurt, water, and oil with a fork or whisk until well blended. For each pancake, pour slightly less than ¼ cup batter from cup or pitcher onto hot griddle. After 1 to 2 minutes or until pancakes are bubbly on top, puffed, and dry around edges, flip them over. Cook other side 1 to 2 minutes or until golden brown.